THE heavens opened on 27 January with a force not seen for years, turning drylands into wetlands again. At least Bellarine ducks and waterbirds were happier that the motorists and pedestrians who battled their way through the rain in Geelong. 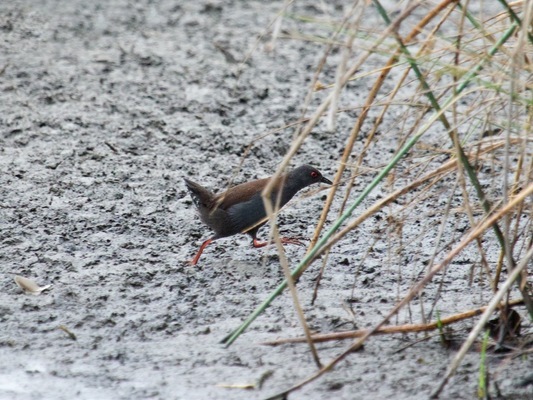 Before the ‘big wet’ I noticed a few crakes darting between the reeds at Blue Waters Lake. I thought that they were very plain looking, with few markings, unlike spotted crakes and Baillon’s crakes, but they wouldn’t show themselves to me for a photo opportunity, unfortunately – so I was unable to confirm my suspicion that they were in fact spotless crakes, until Kevin Teasdale sent me a photo that he was able to snap. So I am very happy to say that I can add spotless crakes to my bird list – you beauty. I haven’t seen them since the rain, so I think they have had to move on to shallower areas. Crakes are members of the rail family of wetland birds, which also include coots, moorhens, and swamphens, among others. Thanks so much Kevin for the photo. Speaking of Blue Waters Lake it was lovely to watch the Australasian grebe families thriving after hatching, and also photograph the Japanese snipe that was so used to me that it actually didn’t fly away. ‘Voice’ reader Allan from Woodlands wrote to me to report that he had seen a deceased tawny frogmouth near the Ocean Grove Nature Reserve (boo hoo). He thought that it looked like the tawny had been attacked by a fox. Anyway I see that Parks Victoria are about the commence fox baiting at the reserve so hopefully the offending fox will meet a timely end itself (sorry fox but I don’t like you at all). The young kookaburra that was born late last year in Chris and Pete’s garden in Woodlands is thriving which is great to hear. I also received a lovely email from ‘Voice’ reader Su, who is concerned about the future of a rather large pond in the paddock at the end of Parkside Drive, in the yet to be fully developed area of Kingston Estate. Su wrote that the pond appears to have been a farm dam, and that in the wetter months there is a grassed area where frogs, egrets and herons thrive. I have written to the COGG about this pond and have yet to receive a reply. Hopefully there is a plan to maintain this area in its current state. There was a small reeded pond by the side of Banks Road in the developing area that I have noticed has been completely dug out and all of the reeds have been removed. Andrea Dennett, who is the co-ordinator of the Bellarine Hooded Plover volunteers, reported on the 5 February that at Point Lonsdale two chicks are due to be fledged this weekend, which is fabulous news. Also at Point Lonsdale, another pair of hoodies hatched two chicks on the 28 January but the chicks were missing soon after possibly related to the extra activity on the beach related to the plane crash the day after hatching. At Collendina the pair of hoodies known as NZ and unb are onto their eighth nesting attempt for the season – this nest is located 1.5km east of 5W and the young are due to hatch in late February or early March. Another pair of hoodies known as AD and unb’s made a nest, located 500m east of 5W, and the eggs were due to hatch on 20 January, but this failed after the 44-degree heat, storm and gales that occurred on 13 January. They now have a new nest 50m west of the 6W access, and the eggs are due to hatch late February or early March. Please look out for chicks in these areas and keep dogs on leads at all times where there are hoodie signs. I received an email from Peter, who is a member of Birdlife Bellarine. He told me that he had red-whiskered bulbuls (RWB) in his garden in Clifton Springs. I remembered that Tom Fletcher and Neil Hickman and others had seen this species of bird a few years ago (2013 to be precise – thanks to Google) in Clifton Springs, and at the time they were thought to be escaped cage birds. RWBs are native to southern Asia, but were introduced into Sydney in 1880 and later to Melbourne around the mid-1900s. The Melbourne population has remained fairly concentrated; but the birds from Sydney have spread along the east coast. 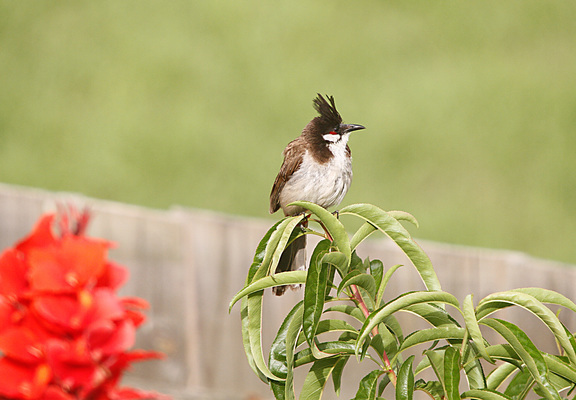 The red-whiskered bulbul is very distinctive, with its pointed black crest, white cheeks, brown back, red under tail coverts, and long, white-tipped tail. These birds have a small red whisker mark below the eye. Both male and female birds are similar in plumage. I went to Peter’s home and lo and behold, two RWBs made a grand appearance, and they were making a meal of Peter’s cherry tomatoes in his vegie patch. The last bulbuls I had seen were the many red-vented bulbuls that I encountered in Hawaii a few years ago, so it was lovely to see some bulbuls on the Bellarine. Thanks so much Peter. John Bowman has started a very worthwhile campaign to save the trees aligning the new estate in Grubb Road from destruction. These trees are home to possums, red-rumped parrots, eastern rosellas, noisy miners and many other native birds. I’ve seen raptors sitting up in the trees perusing the landscape, which they won’t do when there are just houses to see. I think John has a worthwhile point that the trees will add distinction and character to the area and there seems to be no firm reason to get rid of them. I’ve also discovered a new hobby lately and that is spotting Australian hobbys. There was a pair of hobbys hanging around the Ocean Grove Fire Station every day for a few weeks. 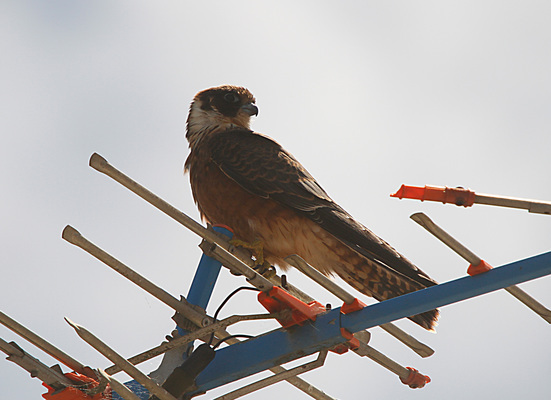 I even took my car to get serviced in the Industrial Estate and saw a hobby there. I haven’t seen them for a few days so maybe they have moved on.